F1-ATPase is a unique enzyme in terms of its rotational catalytic activity. The smallest unit showing this property is the α3β3γ complex (351 kDa). 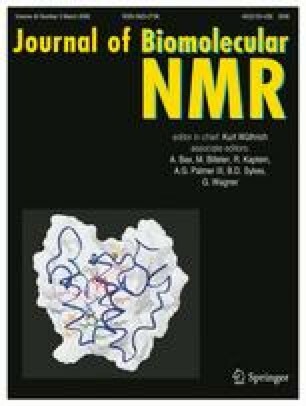 For investigation of such a huge system by means of solution NMR, we have explored a suitable NMR method using F1-ATPase subcomplexes from a thermophilic Bacillus PS3 including an α3β3 hexamer (319 kDa). Pulse sequences for large molecules, effects of deuteration and simplification of the spectra were examined in this work. Since the β subunit includes the catalytic site, this was the target of the analysis in this work. The combination of [15N,1H]-CRINEPT-HMQC-[1H]-TROSY, deuteration of both α and β subunits, and segmental isotope-labeling was found essential to analyze such a huge and complex molecular system. Utilizing this method, subcomplexes composed of α and β subunits were investigated in terms of inter-subunit interactions. It turned out that there is equilibrium among monomers, heterodimers and the α3β3 hexamers in solution. The rate of exchange between the dimer and hexamer is in the slow regime on the NMR time scale. In chemical shift perturbation experiments, the N-terminal domain was found to be involved in strong inter-subunit interactions. In contrast, the C-terminal domain was found to be mobile even in the hexamer. The online version of this article (doi: 10.1007/s10858-007-9216-0) contains supplementary material, which is available to authorized users. This work was partly supported by Grants-in-Aid for Scientific Research on Priority Areas from the Ministry of Education, Science, Technology, Sport and Culture of Japan (HA), and ERATO (MY). We are also grateful to Prof. Takahisa Ikegami (Institute for Protein Research, Osaka University) for his help in the NMR measurements.